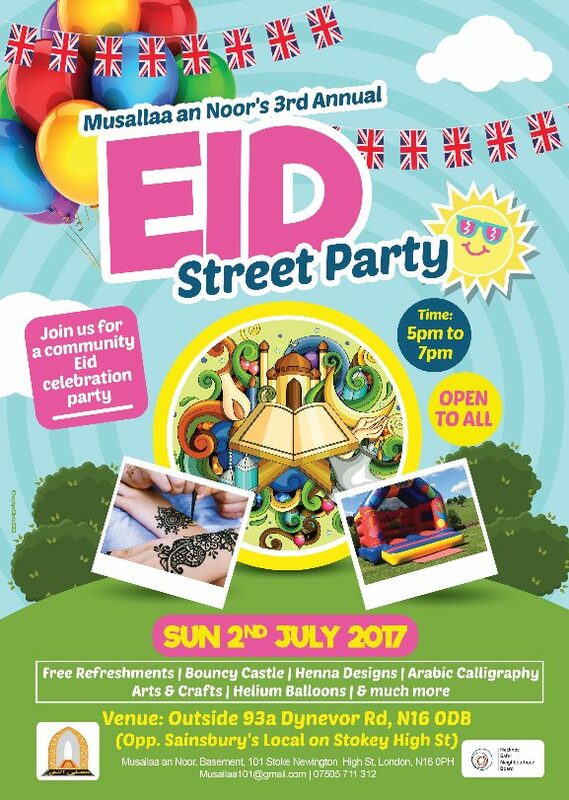 On behalf of Musallaa an-Noor Mosque I would like to take this opportunity to invite you to our EID STREET PARTY, where we plan to celebrate the Eid festival with our neighbours, Faith Leaders, Community representatives and the wider community. After the success of last year’s event, we are again inviting all local residents & businesses, as well as all Hackney community, social and voluntary organizations and the wider Hackney community to share an enjoyable evening of food, drink and festivity with us. We aim to display the true characteristics of Islam and of Muslims to all our neighbours who live beside us and to portray the message of love, harmony and peaceful co-existence that our beloved Prophet Muhammad (peace and blessings be upon him) taught and strived his whole life towards. We learn from his sayings; “A true believer is not one who sleeps on a full stomach whilst his neighbour is hungry”. We hope you will accept our invitation and grace us with your presence. We will also be having a henna table and an Arabic calligraphy stall to showcase Islamic art.